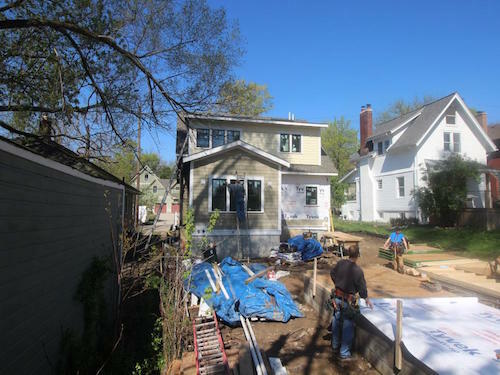 HGTV’s Urban Oasis project, a televised giveaway sweepstakes that works with local designers and architects to renovate an urban home, has selected Ann Arbor as its 2016 location. The project marks the first time a Michigan home has been chosen for the sweepstakes. A 1,500-square-foot, 1925 Craftsman-style bungalow is the property for this year’s home renovation project. The home, which completed construction in June, is currently being decorated and photographed. Ann Arbor-based Maven Development worked as the general contractor for the project, while Plymouth-based residential architecture firm Studio Z Architecture was selected as the architect. “Throughout the entire process, HGTV and the talented project team made this a highly successful collaboration, and together, we transformed the house into a really special home I think viewers will love,” say Dawn Zuber, architect for the project. She says renovations to the bungalow included a small addition to the back of the first floor and a new partial second floor, which allowed for the creation of an L-shaped open kitchen, dining, and living room; two master suites, a laundry room, a mud room, and a powder room. An episode detailing the project will air on HGTV at 11 p.m. on Oct. 5. After the episode airs, viewers can enter an online giveaway to win a grand prize package, which includes the renovated Ann Arbor home and all its furnishings, along with $50,000 provided by Detroit-based Quicken Loans. This marks the seventh year for the home giveaway sweepstakes. Past HGTV Urban Oasis homes have been located in New York City, Boston, Atlanta, Miami, Chicago, and Asheville, N.C.